Happy New Year guys!!!!! I hope everyone had a great festive season with their friends and family and I wish you all the very best for 2016!!!!! 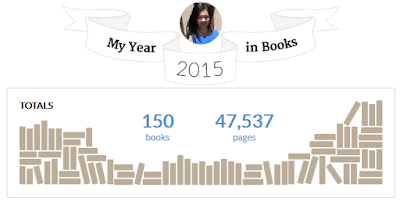 Looking back on 2015, I must say I have had a great reading year. It was stressful meeting my reading goal of 150 books but I managed to make it just under the wire by finishing my 150th book on the 29th of December. And after all that reading (47,537 pages according to GoodReads), there are a few lessons that I took away from my reading experiences in 2015. By far the biggest lesson I have learnt is that the number of books you read isn't everything. Sure, it feels impressive to say I have read 150 books last year but in the pressure of meeting deadlines, I have often picked up books that I knew before I even started that I wasn't going to like but I proceeded to read anyway because they were short. Another sacrifice I had to make in order to reach my 150 books goal is that I couldn't go back and revisit my favourite books. There have been moments when I was really in the mood for a particular book but I had to stop myself from reaching for it because I needed to keep reading new books. A prime example would be the lead-up to Christmas, I was dying to reread the anthology My True Love Gave to Me by Stephanie Perkins et al but I couldn't because at that stage, I was already 2 books behind schedule. All of us have busy lives and apart from the lucky few, reading and book-blogging are hobbies on the side rather than the central focus of our lives. This year, I was working full time as a surgical resident, studied for an anatomy diploma (which the university considered as full-time study) and also sat for pre-SET surgical exam. There were days (weeks) I was surviving on 4 hours of a sleep a night and yet I found the time to read, whether that was on the train, just before bed-time or on my days off. I didn't think those snatches of time counted for much but looking back, I managed to finish several books with those 20 minute blocks. While I haven't succeeded in my 2015 reading goal of reading 12 classics (more on that later in an upcoming post), I did read a couple of classics and even though they took forever, Same thing applied to award winning books. I don't think I would have picked up The Narrow Road to the Deep North or All the Lights We Cannot See if I were just browsing the bookstore, and these two have turned into some of my favourite books of all times. So in 2016, I am looking forward to testing some more uncharted waters. I will be bringing my top books of 2015 in an upcoming post (so hard to decide!) as well as my 2016 resolutions. But in the meantime, Happy New Year to all of you once again! And I'm looking forward to spending another year with you guys in this awesome book blogging community! Wow, 150 books is crazy. I wish I could read that much. I also read The Narrow Road to the Deep North last year and really liked it. I've taken advantage of our library's audiobook collection to re-read a few of my favorites books this past year. It's been fun to absorb an old favorite in a new format.